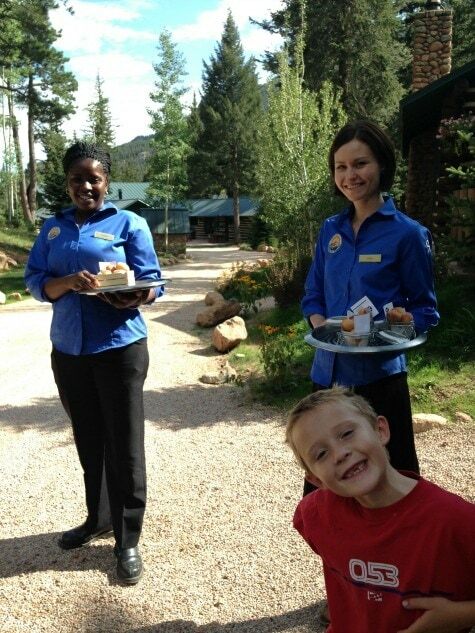 I am often torn between two worlds when my family stays at Colorado’s ultimate luxury resort, the Broadmoor. I love to be pampered but I’m also an outdoor lover; those worlds just don’t often mix. Until now. 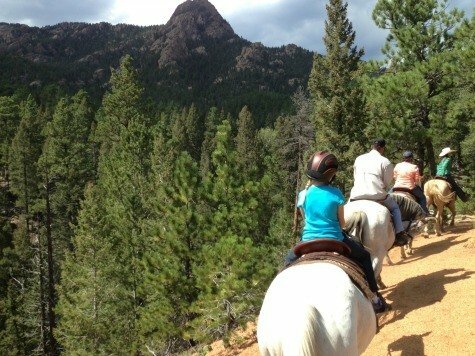 Set on 15 acres deep in Pike National Forest, the Broadmoor’s Ranch at Emerald Valley offers glamping at its finest. The Broadmoor opened its newest venture, the Ranch at Emerald Valley, in early-August of 2013. The Ranch offers luxurious woodsy accommodations in nine beautifully restored cabins. Gourmet meals are prepared three times a day in the lodge. It’s romantic, awe-inspiring, whimsical and family-friendly all mixed into one great glamping vacation. 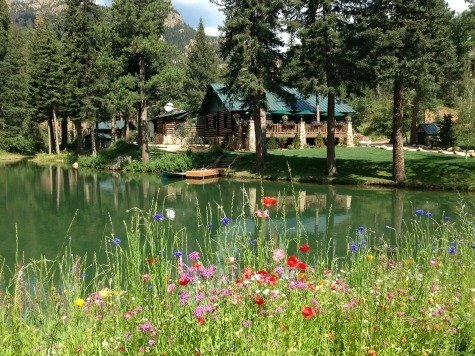 I was asked to do a write-up for The Broadmoor Magazine so my family spent 24 hours in this wilderness enclave. The Ranch is not accessible to the public so we checked in at the Broadmoor and then were escorted via shuttle 30 minutes into the mountains up serpentine Old Stage Road. When I first arrived at the property, I was stunned by the hypnotic ever-changing play of light on Hummingbird Pond and Penrose Lake. The wonderful thing about the Ranch is you can do it all or do nothing. While some guests kicked back on the deck soaking in the views and reading. My family, on the other hand, did it all. 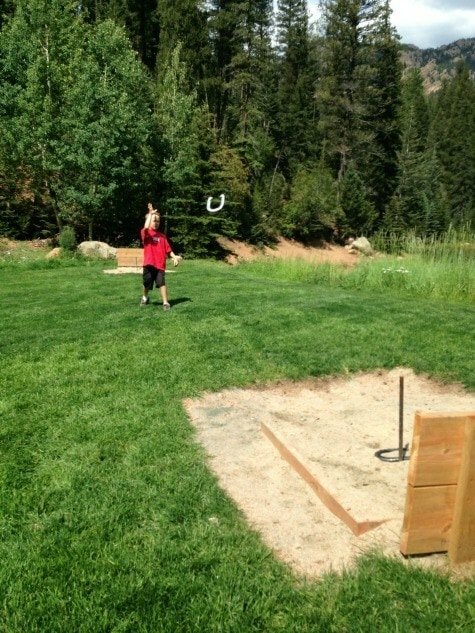 My kids raced over to the expansive lawn where my son’s first item of business was playing horseshoes. My daughter opted to channel Merida the Brave with archery. After mastering the targets, she and my husband moved into the woods to attempt to bag the deer and boar statues that stood sentry. 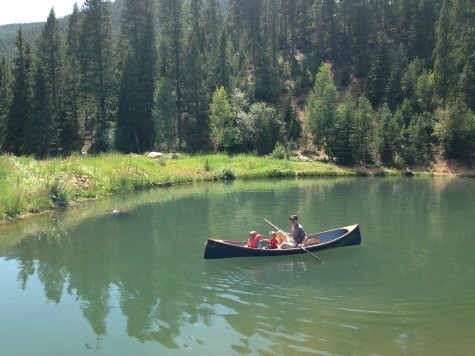 And what would a mountainside retreat with a lake be if you were not able to canoe? My kids had never been fishing and I worry that fly fishing at the Ranch may have spoiled them forever. 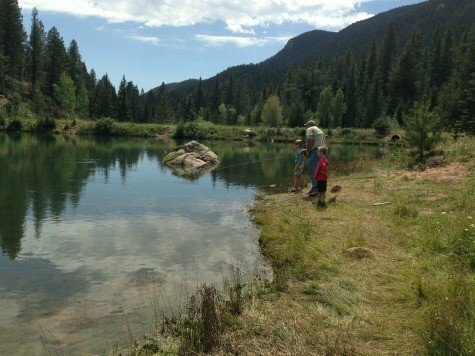 With two bodies of water fully stocked with rainbow, cutthroat, brook and brown trout, it was almost like the Broadmoor had those fish under contract to delight us with their out-of-water acrobatics. It also helped that the fish were easy to hook and, as a bonus, the chef cooked up our catches for us! Horseback riding is included as part of your stay at the Ranch. We’ve been on a few trail rides as a family but nothing quite as challenging or scenic. With the Gray Back peak towering above us, we climbed around Mount Vigil and down Emerald Valley Road. The terrain was often steep and narrow. I looked at Bode nervously and often. He had just barely met the 7-year-old age requirement. Thankfully the horses were pros. Unlike me. A mirage of tasty goodness greeted us after our hot, sweaty ride. Two staffers tracked us down to present the mid-afternoon snack: fresh beignets oozing with Colorado Palisade peaches. In the evening, we played board games provided by the lodge, enjoyed fine dining (yes, kid-friendly items are available upon request! 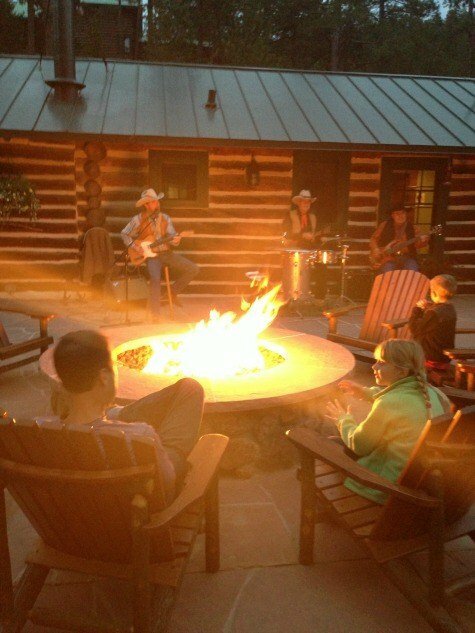 ), and listened to live cowboy tunes by a blazing fire. Later, we built a campfire at the gazebo. 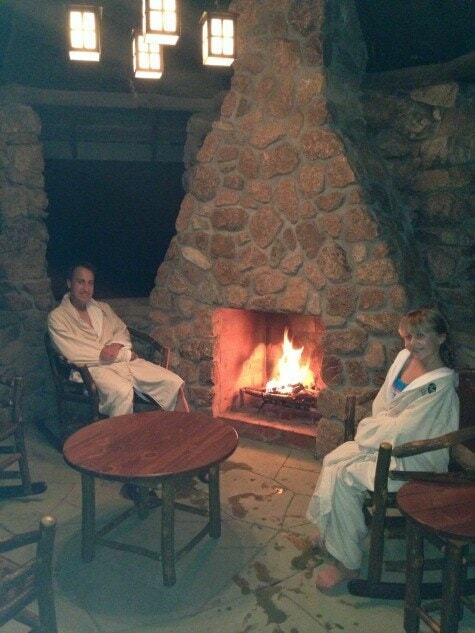 Then we soaked in the adjacent hot tub under the liquid-blue moonlight. The next morning, my family arose at dawn to hike a network of trails deep into Pike National Forest. We ate the best cinnamon rolls ever at the breakfast buffet, fished, did more archery, climbed the property’s waterfall and literally went into mourning when we took the shuttle back down the mountain. Our only solace? We spent the next two days at The Broadmoor‘s main property in Colorado Springs. That’s pretty much the only way you’ll ever come down after the Rocky Mountain High you’ll receive at the Ranch. Built in 1918, this AAA Five-Diamond resort in Colorado Springs features an award-winning spa, championship golf, an incredible infinity pool with waterslides, a luxury-retro bowling alley eatery, and much more. The Ranch at Emerald Valley is open seasonally May through October. For more information on area activities and rates, visit the Ranch at Emerald Valley’s website. 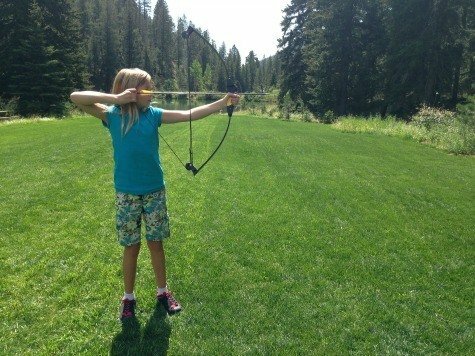 A Note from The Outdoorsy Travel Mama: My family was hosted by the Broadmoor. All opinions are mine, as always. It looks and sounds like a great experience! Our son would love to have an vacation like this. A couple of weeks ago we did a glamping trip in Canada at Dinosaur Provincial Park, we all had a great time searching for fossils and hiking the trails. Next time we go through Colorado this will be a place to spend some time.